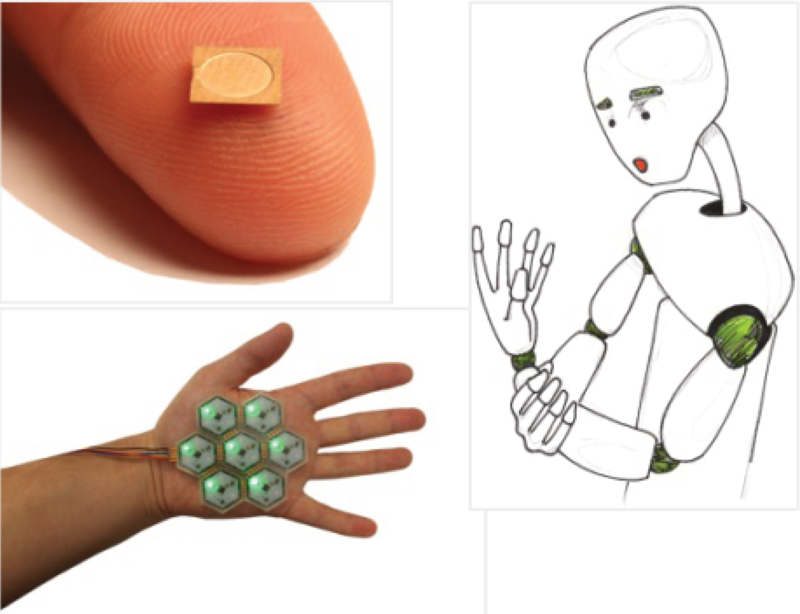 The accurate sensing of forces on surfaces of equipment such as robots, mobile phones and industrial machines is one of the central tasks of designers of human-machine interfaces. Currently used sensor cells use a variety of physical effects to convert forces acting on surfaces in locally measurable physical quantities. In addition to capacitive methods mostly resistive methods dominate the market. Challenges in producing such cells and accurately measuring the sensor forces due to hysteresis or limited bandwidth restrict the range of use of such sensor cells. Because of these advantages force sensors can now be applied to printed circuit boards or other, possibly flexible, substrates efficiently and precisely while ensuring durability and compact arrangement. Several thousand sensors can be evaluated per second in order to create a surface contact profile. The invention is suitable for numerous applications in industry, be it level gauges for liquid reservoir, smart buttons for consumer electronics or receptor surfaces for robotics acting as artificial skin.